With Election Day only a month away, the race to become president is at full speed! 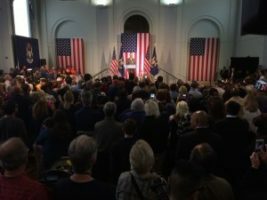 The presidential candidates, vice presidential candidates and even their spouses are hitting the road looking to gain support. 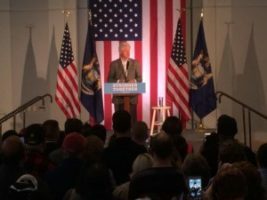 President Bill Clinton was in Flint, Michigan recently and I was there with my camera waiting to capture his arrival. When I say I was waiting, I mean some serious waiting. When you’re dealing with a former U.S. President, security is no joke. Media crews are required to arrive five hours prior to the event to set up their equipment before Secret Service sweeps the entire building for four hours! I set up my Panasonic HDX-900 with a long lens on the risers at the back of the room, ran a cable for audio and checked my color balance and exposure. Once I had audio levels and the camera was set properly, I enjoyed a nice long four hour lunch break. Not something Go To Team crews are used to. We’re always ready to shoot. When I returned the crowd was starting to file in and the media riser was crowded full of both video and still cameras. 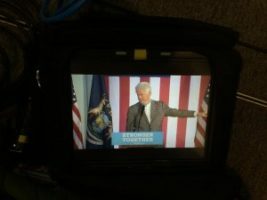 President Clinton arrived promptly at 3:30 and I fed the first half of his speech via a LiveU unit to the NBC Political Affiliate in Washington D.C. Then the LiveU was pulled to feed footage for that night’s broadcast. I rolled tape for the end of the speech, then I packed up and headed to downtown Detroit to feed the remainder of the tape to D.C. via their Detroit affiliate. Once the tape was ingested, I hit the road back to Chicago. 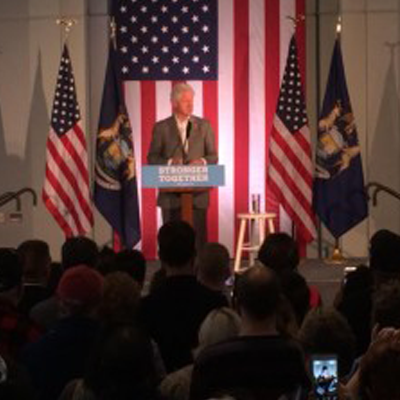 Just another day on the campaign trail. Both campaigns will keep busy up until November 8th!